The answer to your question is: “Yes, of course we had Chinese food!” The Kosher Chinese take-out was bustling and I heard a call from the back that they had run out of vegetable lo mein and General Tzo’s chicken. Luckily, I had called my order in two days earlier. And yes, we saw a movie too. Before these traditional Jewish ways of celebrating Christmas, however, my family participated in a newer tradition. It is one that I hope catches on. We volunteered our time. At lunchtime, we visited a nearby nursing home where we transported residents to physical therapy and to a music program. I fed lunch to residents in a dining room where they were short-staffed. As I fed them lunch, I sang to the residents and responded to their questions and reminiscences. Even if they were confused, I found a way to honor their communication. One of our friends and her seven year old daughter played many games of Checkers and Gin Rummy. I am certain that our acts of kindness made a difference in the days of these elderly nursing home residents. It occurs to me, however, that the most important recipients of our chesed might have been the staff. Everywhere we went in the building, we asked the staff, “Do you celebrate Christmas? Thank you for your work today.” We were asked why we had come to the nursing home, and our answer of coming to help on a day that was someone else’s holiday was met with delight. I add just one more thought to Rabbi Olitzky’s wisdom: Don’t wait for next December 25 before you find a way to repair just a small corner of the world. Many of our congregants volunteer in beautiful, quiet ways: reading to a person who is blind, visiting with a congregant in a rehabilitation center, clowning around in hospitals, sorting clothing and home goods at People to People. If you need ideas on how to participate in acts of Chesed, contact me at Rabbi.Drill@theojc.org. I’ll be proud to put you in contact with our Chesed Committee, Helping Hands or one of the many worthwhile organizations and institutions here in Rockland County. Make it a secular New Year’s Resolution to volunteer your time and skills! You won’t believe how good it feels! Our sages tell us that we are meant to live as if there is an eye that sees, an ear that hears, and a book that keeps track of all we do. You might think this is enough to drive us to paranoia! In fact, living one’s life as if someone is always watching even our most secretive acts can lead to a more conscious, more intentional existence. Case in point: a few weeks ago I attended a Saturday night community jazz concert. Shabbat had been a busy one, including a Friday night program, a Shabbat morning bar mitzvah, a lecture after lunch, and a Shabbat afternoon bat mitzvah. Needless to say, I had no Shabbat nap. I settled into the comfortable auditorium seat, the lights were dimmed, and the mellow saxophone began to sing. You can guess what happened next. That’s right, I fell asleep. A week later, I had a meeting at our community campus. A colleague said to me, “I heard you are not much of a jazz fan.” “What do you mean?” “I heard you fell asleep!” Ouch. A few days later, while shopping at Fairway, I saw someone from the community I hadn’t seen in a while. “When was the last time we saw each other?” “Actually,” he answered, “I saw you at the jazz concert. You must have been pretty tired.” Double ouch! I actually enjoy jazz; if I ever need some help falling asleep, it’s the Carpenters, John Denver or jazz that does the trick. But one short shloof, induced by exhaustion, mood lighting and music, and I am the talk of the town! Okay, so I exaggerate a bit to make my point. I understand that I live in a fishbowl, as do many public figures and leaders. The point our sages make, however, is that we should all feel that we are living in a fishbowl, and guard our words and deeds accordingly. Every action, reaction or inaction can be understood as intentional, so we must live intentionally. Every action, reaction or inaction can be understood as a conscious choice, so we must live consciously. In doing so, perhaps we save ourselves a bit of shame, a bit of guilt, a bit of regret, and a bit of being a topic of other people’s conversations! 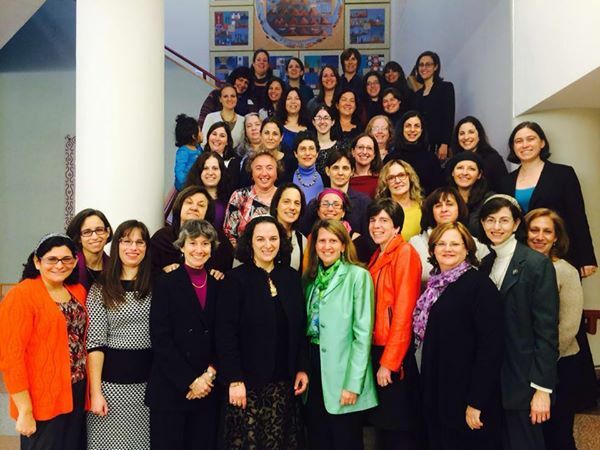 I was one of sixty women, all members of the Rabbinical Assembly of Conservative Judaism, who gathered at the Jewish Theological Seminary on Monday and Tuesday, December 9 and 10 to connect, learn and replenish our minds and souls. The title of the conference was “Leaning In, Leaning Out, Learning from Each Other.” The learning, prayer, and opportunity to connect were all valuable. But that is not what is on my mind as I think about the conference in the days since it ended. I am thinking about what it means to be present, completely and wholly present. In her opening talk, Rabbi Amy Eilberg, the first ordained woman of the Conservative Movement of Judaism, explained to us that her work has been about cultivating compassion. That work, she asserted, can only happen through true listening, through being present to another and thereby to God. She reminded us that careers in the rabbinate are guided by what we believe God wants of us more than by ambition. I spent the rest of the day asking myself how I could ever know what God wants of me. As I listened to fellow rabbis, talked in small groups, and took notes, I asked myself the question about what God wants. And then the answer came to me as I pictured myself in our sanctuary at the OJC. Above the ark, the words are carved: “Shiviti Adonai l’negdi tamid.” I place God before me always. I can know what God wants of me by being quiet enough, in the sanctuary of my soul, to listen. And to do that? I must be present. I must be in the moment with each of you, with the children of the Religious School, with the youngest children and their grown-ups at Early Kabbalat Shabbat. I must be fully present in your loved one’s hospital room, at your kitchen table or across the table from you at Starbucks. I must be present in the moments we share on the telephone. And then, at the end of our moment, I must listen to my soul deeply enough to reassure myself that I am doing what God wants of me. Did I listen to you? Was I fully present to you? It is not easy to be fully present in the year 2013. As we rabbis sat in a room, sharing our dreams, our insecurities, our prayers, many of us focused on the faces of whoever was speaking. If I place God before me always, then I must look for God in the faces of my fellows. But a great number of us were typing away on i-pads, laptops, phones. Several in the room were tweeting. A difficult conversation erupted about this fact when confidentiality was breached with tweets that quoted what specific women were saying. Those who were tweeting defended their actions by stating the importance of sharing what was happening in the room with the public. I wonder how we can be in this moment, however, when we are already shaping it to share it with a nameless public. I understand that tweeting is meant to connect us, but doesn’t it distance us instead? One rabbi said that she is more focused when she is tweeting than when she is just listening. There is a difference, however, between being focused and being present. Rabbi Eilberg had just told us that we must remember to be present to others. The result of the conversation was to shut down the tweeters. Sometimes it is valuable and important to get the word out. I understand the value of social media; after all, here I am blogging to you all! But sometimes it is much more important to get the word in. Lean in, lean out. Utimately, we chose to lean in, to lean within, to be present to each other and to ourselves — with the hope and prayer of being present to God. The Haftarah assigned to this week’s Torah portion, Vayigash, is Ezekiel’s vision of a future reconciliation and reunification of the Northern and Southern tribes of Israel. The Northern tribes had been dispersed and exiled from their land by the end of the eighth century B.C.E. With the destruction of the First Temple in 586 B.C.E., the Southern kingdom of Judah met its end. Ezekiel preaches from exile in Babylonia in the years following that destruction, and his vision of a time when the tribes will be united and a single monarchy will lead the nation in its land must have been a comforting and hopeful buoy for a community on the verge of total extinction. Ezekiel holds two sticks, one inscribed with the name of Judah (representing the southern tribes) and the other with the name of Joseph (representing the northern tribes). God instructs Ezekiel to bring them together so that they will become one stick. The symbolism of the sticks serves to tell the world that the Israelites will again be one nation, with one king, in their land, serving the one God and sanctified by God. Finding ourselves in the midst of the holiday season, family dynamics tend to take on greater prominence than during the rest of the year. Tension grows as excitement grows. Anticipation of family reunions, and the revisiting of longstanding (and sometimes strained) relationships raises the level of anxiety for many people. Sometimes the emotional and social exiles we experience from one another are the result of an act of God (as Ezekiel sees it—some event for which no one can claim responsibility), and sometimes they are the result of an act of a person (as in the case of Joseph and his brothers—some careless or intentional act that leaves us hurt, angry and resentful). Sometimes, we can’t even remember what started the whole uncomfortable dynamic, but we can’t imagine freeing ourselves of it! It would be wonderful if we could write our names on stick, hold them together, and cure all that separates us. But that’s not the way it works. Ezekiel’s vision, however, does offer us some guidance. With one God, with one mission, with one sense of direction, we are made whole despite our differences. We don’t need to agree on all things to be one people. In fact, according to our sages, when two sides argue over an issue, and each side is truly dedicated to serving God in their position, the argument is worthy of being preserved! Such disagreements, however, are not meant to divide us. They are meant to bring us closer because of the passion and dedication we see in each other. Imagine how different our political or religious discourse would look, both in Israel and here in the United States, if members of every party or movement trusted that their opponents’ sole interest was the serving of the greater good. Perhaps compromise would more easily be reached if we didn’t have such a terrible track record of self-interest; perhaps more common ground would be explored. Within our own family structures, imagine how much better we would get along if we forgave insult, if we believed that we all want to be loved and accepted, if we opened the door to reconciliation and allowed two to dwell as one for a while. I can’t promise that God is going to bring about reconciliation and unification to the north and the south, the secular and the religious, the Republican and the Democrat. But I know that I can open the door, just in case. Like you, I cannot count the number of emails and posts I have received regarding the confluence of Thanksgiving and Chanukah this year. Before I delete them all from my in-box or my attention, I want to consider the importance of this week for us as Jews, Americans, and members (or friends) of an amazing synagogue in Rockland County, New York. GRATITUDE: Two holidays falling together on one day helped me ponder the gratitude I feel about being an American who is free to be an observant Jew. In our family, we take turns around a table filled with three generations, sharing what we are thankful for. This year, we then turned to a chanukiyah sculpted by my father-in-law and chanted the blessings of the holiday. We had too much to eat, laughed at family stories told year after year and held quiet conversations to catch up with family members who live far away. We are blessed and recognized it with thankfulness. LIGHT: The rabbis taught that the soul is God’s candle. When we kindle the lights with the shamash each night, it is clear to see the wisdom in this teaching. The flame is not diminished in the least as it touches the wicks of each night’s candle, causing each one to light. So too with us. When we share the light of our unique souls, we are not diminished in the least. Rather, we spread light to others. MIRACLES: This past Shabbat, Rabbi Scheff spoke about the requirement of human initiative to bring about miracles large and small in our day. Consider the fact that Mitzvah Day has turned into Mitzvah-Week-and-a-Half and we can see how many congregants have taken the steps to bring about moments that should not be taken for granted. 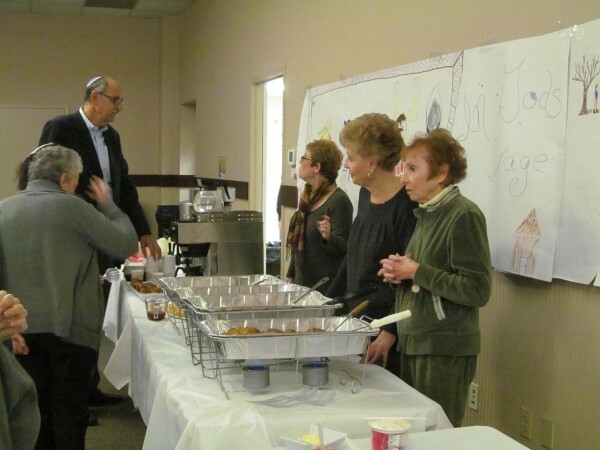 Mitzvah-Week-and-a-Half began on Sunday, November 17 when a dozen congregants joined Rabbi Scheff in Israel for the annual Orangetown Jewish Center Mitzvah Mission. Members of the group carried with them cozy hats knit by our congregants for children in Kfar Ahava, our beloved residential program for children who must be removed from abusive or neglectful homes. Watches were wrapped with gift cards created by our sixth grade Religious School students as b’nai mitzvah gifts for the children. Teenager Tamar Weinger (traveling with her dad) brought rainbow looms with her and taught the children how to make the bracelets that are all the rage. Members of the Mission spent important time at the residence, renewing bonds, assisting children in a mitzvah project of their own, and celebrating the milestones of Kfar Ahava. They also volunteered with Leket Yisrael and toured a handicap-accessible nature path in the north. I hope that you read all about the adventures and miracles created by our fellow congregants in Rabbi Scheff’s daily letters from Israel. Like all important Jewish days, Mitzvah Day began at sundown of the day before. 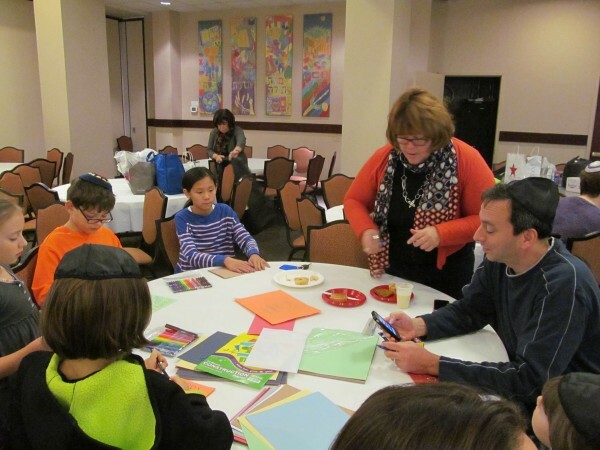 Young children and their grownups gathered with Rabbi Ami and Loni Hersh and their boys for Havdalah and a movie. While the kids were engrossed in the movie, the adults created blankets for hospitals and nursing homes. At the same time, our Ruach group (grades four and five) led by April Kupferman met to bake for the homeless. 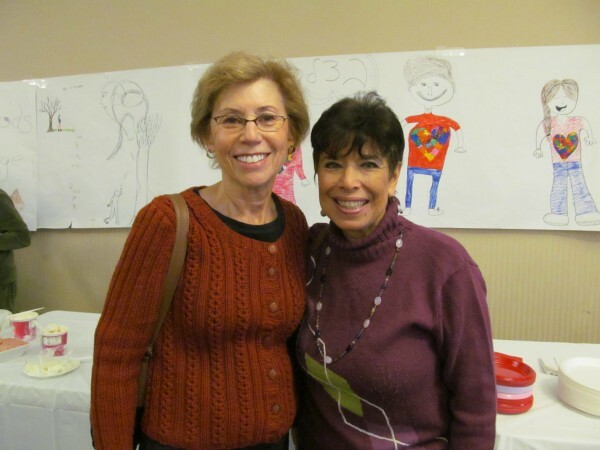 Mitzvah Day, November 24, was an example of the OJC at its very best. A dozen congregants were trained in CPR at the Orangetown Ambulance Corps while one hundred congregants donated blood. After a breakfast and presentation about Leket Yisrael, congregants participated in a variety of activities in the synagogue as well as at a local nursing home, the Hi Tor Animal Shelter and the Salmon House, one of the Jawonio Group Homes for adults with disabilities. In each gesture and interaction, our congregants were empowered to know that they can change the world. We can argue over the definition of “miracle” — but to me, the day was miraculous. Kol hakavod to Lorraine Brown and Carolyn Wodar and their amazing team of volunteers for creating a meaningful, successful day. We didn’t stop there! Tuesday evening, November 26 was the OJC’s first hosting for Helping Hands of this new season. For eight years, we have participated in this important interfaith Rockland County initiative that provides warm, dry places to sleep and hot meals to people who are homeless in our neighborhood. OJC takes it to a different level under the enthusiastic guidance of Gabi Lewy, Geof Cantor, Jack Teadore, Susan Edelstein and Bruce Machlis who gather a large crew of volunteers to shop, set up, cook, greet and stay overnight (thank you Bruce and Liza Machlis!). Helping Hands guests at the OJC experience gourmet meals, donated warm clothing, and the respectful friendship of a crew of teens who participate year after year. Opportunities for your own miracle making abound at the OJC! Contact Adele Garber or Maddy Roimisher to find out how you can give your time and energy to the Chesed Committee. Maybe next year, when Thanksgiving and Chanukah no longer coincide, I’ll be writing about Mitzvah Year instead of Mitzvah-Week-and-a-Half! Join us on Tuesday, December 3 from 6:30 to 7:30 pm as we light Chanukah candles together as our amazing OJC community celebrates our countless miracles!